Ralf Witthaus original source of art is drawing. 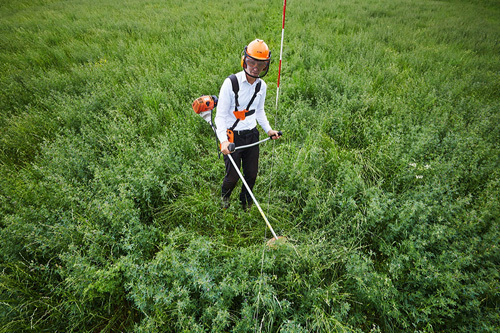 He and his team are using brushcutters and lawnmowers as pencils and draw site-specific contexts in greenspaces. He is interested in what we can not see in the space we live in, but what is nevertheless there. History and tales, social behavior, wishes and architecture, lost and forgotten things and systems. In the beginning of his artist live he was working in scetchbooks – hundreds of them. 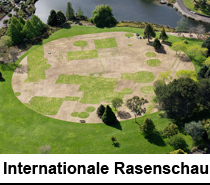 Now he is working at drawings as big as a buiding, as a park, as a Garden Show or like in Cologne 2010 and Würzburg 2014 artworks that are drawn round a city. 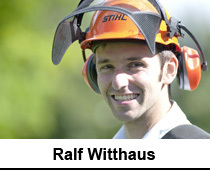 Ralf Witthaus creates artistic experiences in the form of a landscape experience. What he is interested in is the human perspective – on the ground standing or walking – and the changes in the perception of landscape by moving through sometimes kilometer long drawings. 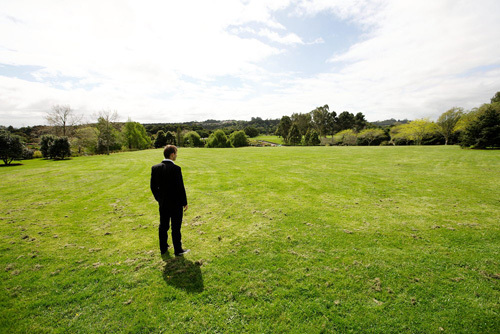 There are often no viewpoints, sometimes not even aerial photos. 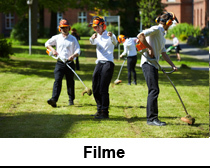 For all of the lawnmower works is essential that there is a strong or poetic story to develop and that the drawing itself is only a part, as important is the perfomative part of this art: The social quality, the stakeholders and the team. Witthaus ask the whole team to work in black and white – and all of them take it as a celebration. The team works together – eats together – talks to people passing by. Most of them are voluntary people. This art produces a lot of personal meeting situations. Unexpected, aesthetical, social get togethers. And the places keep being transformed – even when the drawings are passed. 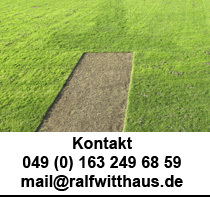 Because even if lawn is cut at the ground level, it needs only three weeks to be there again. Here is a short list of projects with photos and concepts. studied art, design and International Arts Management in Hamburg, Bielefeld, Enschede (NL), Berlin, Cologne and Düsseldorf. In 1998 he created as a student, “The Lying Woman from Werl” – a 550 meter long earth sculpture from more than 90,000 cubic meters earth. 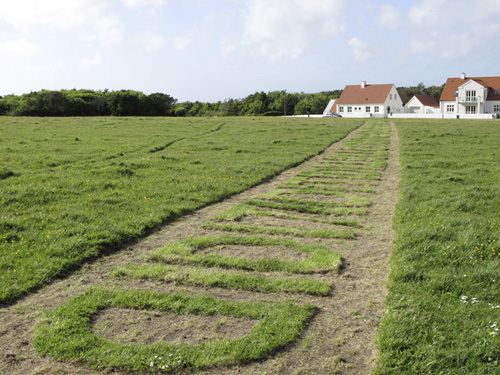 The artist is known for his lawnmower drawings. 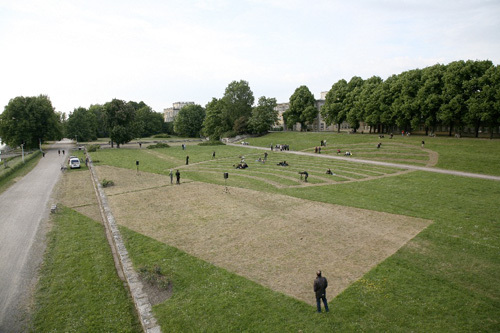 In 2010 he organized the „German Federal Lawn Show“ in Cologne, – a seven-kilometer-long drawing around the city. 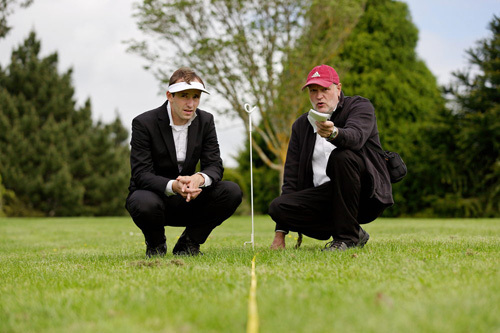 2012 he started an „International Lawn Show“: the „The borehole to New Zealand“, that takes the artist and his team from his hometown Löhne to Auckland. 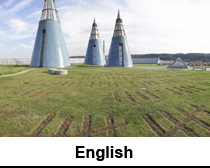 His work combines multi-discipline drawings, sculpture, performance art, community-art, social issues and landscape architecture. 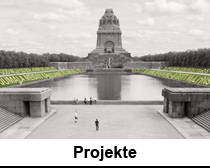 In 2014, with 150 helpers, he drew the unrealised vision of Peter Joseph Lenné’s clinic park in Lengerich. 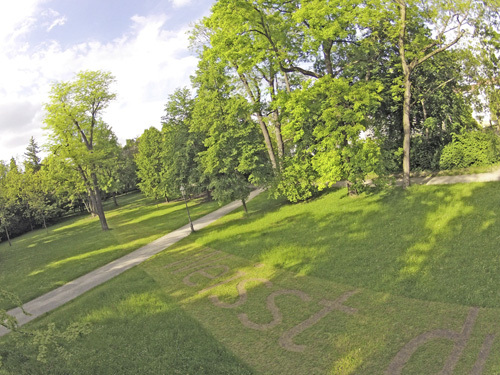 Other major works are the one kilometre long poem „In Deinem Spiegel“ (In Your Mirror), which he created with the Museum of Garden Art 2015 at Benrath Castle, in 2016 the „PERPETUUM“ in Hamburg and in 2017 the drawing of a 600-metre-long string of pearls in the Italian Alps. 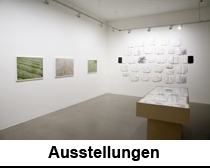 Up to now, Ralf Witthaus has participated with his drawings, collages and actions in more than one hundred and fifty exhibitions in Germany and Europe: e.g. in the Galerie Emmanuel Walderdorff, in the Museum Marta Herford or in the Art and Exhibition Hall of the Federal Republic of Germany. He curated the German Festival EuroLandArt in 2005-2011. 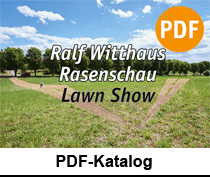 He was a author for the artist magazine atelier and received for his artistic work the Aldegrever scholarship, the star of the year from the newspaper Neue Westfälische and he and his publisher, Christopher Schroer, received the reddot design award for the catalogue of Federal Lawn Show . Her you can find the list of exhibitions, prices and catalogues (in german language). All projects are supported by a lot of people. Witthaus worked together with over 200 volunteers from all over the world and there is also a group of supporting members for the international works. 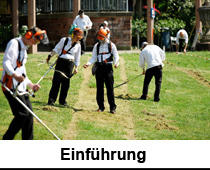 STIHL is the official equipment partner of all lawnmower drawings. 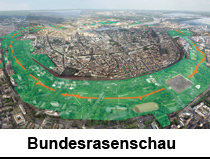 FORD sponsored the two main projects in Cologne and New Zealand with manpower and mobility. The DESIGNBÜRO HARDES+WESSLER takes care about graphics. KUNZ-MAHL gives beautifull catering to openings. LUX+PARTNERS takes care for questions about tax. And there are also every time individual sponsors for the single projects. Ralf Witthaus is searching for interesting places all over the world, places which have history, forgotten tales, interesting architecture or special social things. When you are interested for a project at your place, feel free to contact the artist. If you can organize sleeping places (/host families) and meals for the team and if you have a challenging greenspace or context, you can be sure that he is interested, too.